Mercury Retrograde has a reputation, which is not 100% accurate. 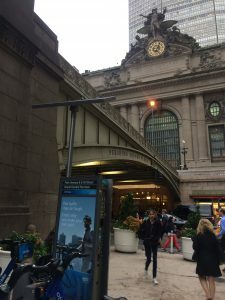 Communications, connections, transit and electronics are all subject to detours and mishaps… but the big message is the RE-. Anything that benefits from reflection and reconsideration is up for review. Yes, electronics in our heavily dependent environment cause trouble. My MacBook decided to fizzle out its display just as this retrograde stationed on 3/22… I’d had an assessment and knew the display was going, yet I procrastinated to make a decision. I put up with the display freezing for months. Those of you who’ve receive my posts know that I wrote daily for years. I stopped, no longer willing to write daily astrology with its ephemeral impact. For some time I’ve wrestled with what to offer that has value in our glutted information packed media stream. I’ve finally landed on a system that feels comfortable to me. I will post on Tuesday, Venus’ day, because the message I want to offer is always one of Love, regardless of how its received. 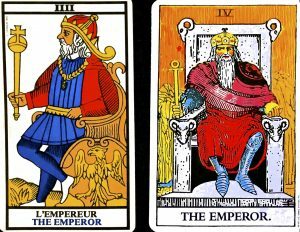 I’ve been teaching a course on the Tarot, a very deep journey to self-knowledge and wisdom. As I reflect and review the lessons I write, I deepen my own relationship with the cards. Contemplation of the Emperor: the original intention of words was to provide order. When things were labeled, ancient people made their way out of the pictorial world and into concepts. Through words, we sort out the chaos of the world around us and establish our identity in relation to it. In today’s world of tremendous chaos, people cling to labels and gravitate to those who spew words that they recognize as anchors to their thinking: eg. snowflake, wing nut, liberal, conservative, socialist, nazi. But words also have the power to manipulate, seduce, distract and divide. Before my writing hiatus, some readers wrote to demand that I just write the astrology of the day; they didn’t want my opinion on the world around me. I found this baffling — with so much astrology content on the internet, why not simply choose another author? I needed time to recenter. My study of the Emperor reinforces my process to use words to decipher the chaos around me. If some readers don’t respect that process, as my father would have said “it’s OK by me”. What has made us so resistant to weigh and understand this chaos? To listen to the media spin, the relentless trolls and righteous indignation rampant on the internet, Respect is a re word that is beyond endangered and threatened with extinction. When words are gathered to transmit emotion, others experience pain, loss, grief, love or anything on the spectrum of human feeling. A common reaction by those who don’t want to receive the message is to reject it by denying the human in the messenger. When a person is demonized, regardless of your feelings about that person, it’s important to realize that a rejection of a message is happening. With the proliferation of blogs, videos, spin, 24 hour news cycles, words have become noise. Patience to read or listen ebbs and the reverence for true knowledge and perspective erodes as overall content has deteriorated. As I write this, a glance at the news shows me that an 85 year old Holocaust survivor, Mireille Knoll was killed in Paris in what seems to be a hate crime — horrific to contemplate all she survived and lost to die in such a way. Only someone who was firmly in viewing her as “other” could kill a helpless old woman. Throughout the world, we see separatism threaten a more holistic world; the movement from Parkland that has taken fire with #neveragain uses words in a familiar mantra: never forget. Whether conscious or unconscious it reminds us that weapons and separatism allow holocaust. 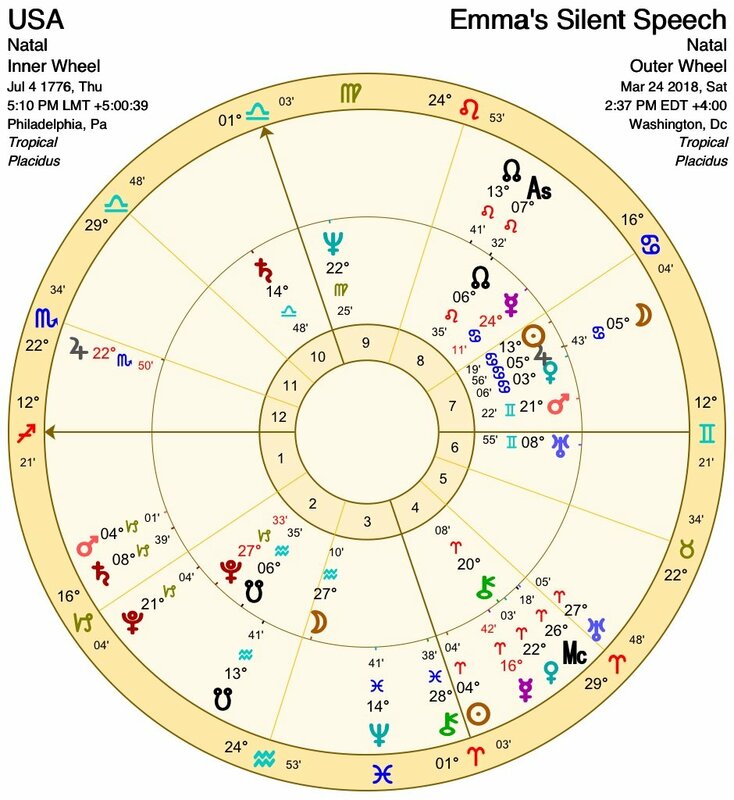 Through the lens of the United States, it might be easy to think the surge towards nationalism is exclusive to that nation, but one of the effects of the separating Uranus/Pluto square continues to expose these endemic toxins in the ability for any nation to become whole. Fear of the other keeps us weak and small. It is a human condition to cling to what we know. Yet to evolve consciously, we need to push past our comforts of labels and identifications that keep us tethered to old ways of being. What we resist does indeed persist. Although the Uranus/Pluto square ended in 2015, we still must process that stand-out configuration in the sky. It symbolized so many upheavals and transformations. The last time this picture occurred was the build up of WWII. The energetic symbolism was different at that time because it was the end thrust of a cycle; not dissimilar to the waning quarter moon before it goes dark. Planets move in orbits like the Moon from our perspective. They line up, like a New Moon. They then make a 90° angle to one another (quarter moon, waxing). Then they oppose one another (Full Moon configuration) and go to one more 90° angle (quarter moon, waning) to finally start all over again. Uranus and Pluto have slow orbits in relation to Earth. As a result, they symbolize situations that take place over time and have long-range impact. From 2012-2015 momentum gathered from what took root in the mid 1960s, when Uranus and Pluto were in alignment in the sky. With the raw energy of a New Moon, the planet of revolution (Uranus) joined the planet of irrevocable transformation and endings (Pluto). Uranus wants immediate action, Pluto delves deep to get to the core. Whatever began in the 1960s has undergone upheaval. If you were born in the ’60s, you may find yourself charged with an invigorated sense of purpose. Activism gathers through the digital world with unprecedented force. This society of like-minds seems dependent on the very electronic connections that are maintained by vast corporate and government structures. My newsfeed alerts me that the Parkland massacre survivor/activist Emma Gonzalez has been the subject of a fake viral video. 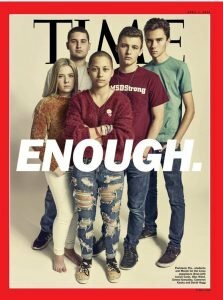 As a mother, these young people move me as though I know them. They don’t need my strong protective urge. They have grown up in a world that seared them and now has ignited their fire. They don’t need my protection; what they need is accountability and they are determined to fight for it. They have connections and the power of a communication tsunami. When Uranus entered Aries in 2011, the earthquakes and tsunami hit Fukushima; now that it leaves Aries, we have another sea change of epic proportions. When Emma Gonzalez stood in front of 800,000 people and international television to be silent, she created a wave of uncomfortable awareness. Some people called her name, others nervously laughed or spoke and then a chant of “never again” before silence once more. She wanted us to feel without distraction how quickly 17 lives were lost. The horoscope at the time of her silence shows Leo Rising, yes a dramatic moment. The Aries Sun so soon after the Summer Solstice creates a square with Mars/Saturn in Capricorn. 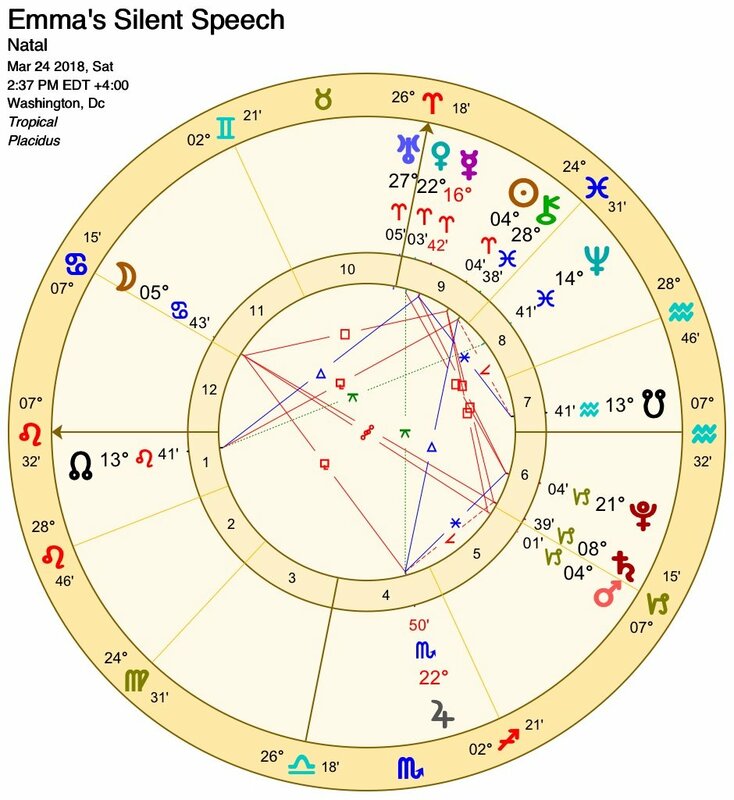 Mars out of the 5th house (children) pushes against status quo Saturn in the 6th (work, health, the routine). Mars/Saturn is a pressure cooker in itself and forces awareness on the true efficiency of the existing model. As firearm companies scramble for bankruptcy insurance, the growing awareness of how much health insurance everyone carries to subsidize gun injuries mounts. Anyone whose ever had a car accident with injury discovers their car insurance handles those claims, not their medical insurance. 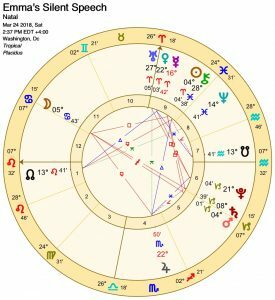 Emma’s silent speech had the Cancer Moon (mood of the people) in opposition to that Mars/Saturn and square that Aries Sun. Whether viewers were for her cause or against it, deep emotions were stirred. 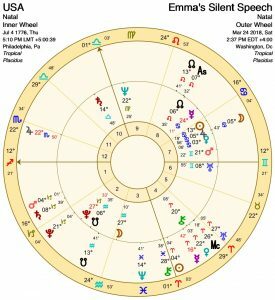 Chiron (the wounded healer) sat on close to the Aries Sun. High in the sky at the midheaven is the Aries Uranus with Venus: young people, warriors of love. This movement, stirred by the Valentine’s Day carnage in Parkland has the power to create real transition in the United States. True transformation has so much to do with timing. When you look at Emma’s Silent Speech as a transit for the United States, the Moon is right on Jupiter and Venus, to create a groundswell of allegiance from allies on board with the message. The magnification of empathy was profound. Is this fleeting? With the Ascendant/Rising Sign on the North Node in the 8th house of transformation, probably not. As the United States continues to evolve towards its first Pluto Return in a few years, we know the country will irrevocably change. The question in so many people’s minds becomes “what country do you want the United States to be?” Are people willing and ready to be the architects of those transformations? There is no question that a person can and has changed the world. Do not let the false god of “reality” tell you otherwise. Every life matters. The #NeverAgain youth are articulate. The youth that align with them are comfortable with a diverse and multicultural world. They’ve gone to school with differently abled children. They don’t need everyone to be like them. They are motivated by Love not Fear. They value both Logos (rational thought and wisdom) and Eros (love and creativity). This call to arms rejects violence. 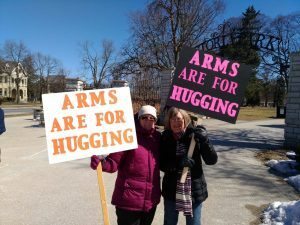 It connects across generations – including boomers who marched in the ’60s . At that time, it was rare to have a senior embrace the message of youth. With the Emperor’s strategy, the youth are determined to conquer the status quo. “Welcome to the Revolution” is an invitation, not an affront. Interested in the Tarot Journey? Next Journey begins 9/8/18 — check it out here.